The DC Super Hero Girls are ready to roll into action at the roller derby! 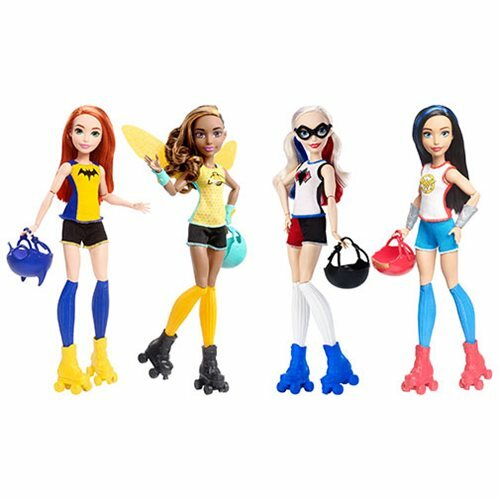 This assortment includes some of your favorite heroes like Wonder Woman, Harley Quinn, Batgirl, and Bumblebee. Each 12-inch doll wears a uniform with shorts, tank top, and socks designed in her signature colors with iconic logos. Each doll is also outfitted with wrist guards and come with removable roller skates and helmets to keep them safe during their fierce roller derby matches! Have a blast creating serious rolling action with this DC Super Hero Girls Roller Derby Doll Case.